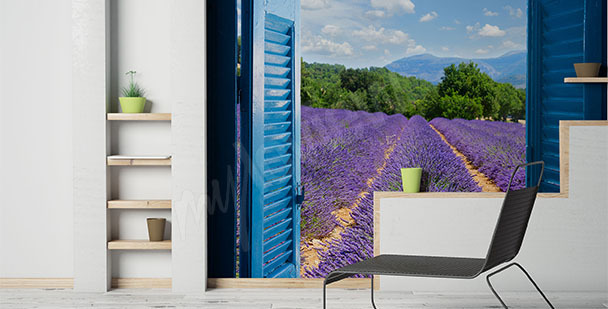 Lavender wall mural is an offer for fans of purple and interior decor inspired by French province. This plant brings to mind the fields of Provence and makes interiors look quite romantic. 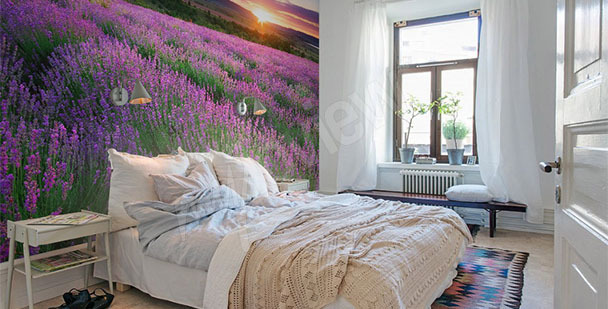 A lavender wall mural is a very feminine motif. It will be perfect for a village house, an interior kept in shabby chic style or interiors without a specific theme. If we want to give our bedroom, living room or dining room an expressive character, a wallpaper lavender seems to be a good option. Finishing elements with plant patterns and flower motifs have been very fashionable for the last couple of seasons.It may seem that flower ornaments can be stylistically binding and they require plenty of compromises and careful selection of additional accessories later on. Nothing’s farther from the truth! The golden mean, or in other words - moderation, is the answer to many questions concerning interior decoration. Today, we’ll ask one of them: how to use a wallpaper lavender in our interiors? 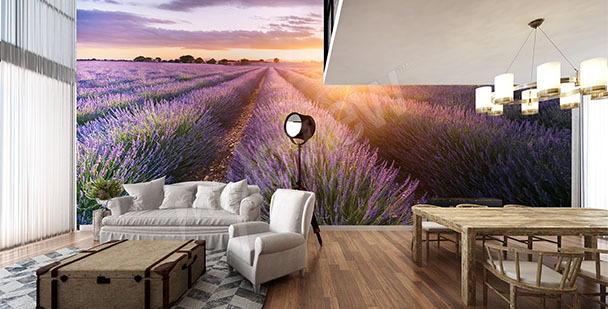 Your living room will gain a romantic character if you’ll place a mural with a purple lavender and golden grass of the Provencal meadows on one of its walls. A wall mural with lavender is a dream decoration for a feminine bedroom dominated by monochromatic accessories. 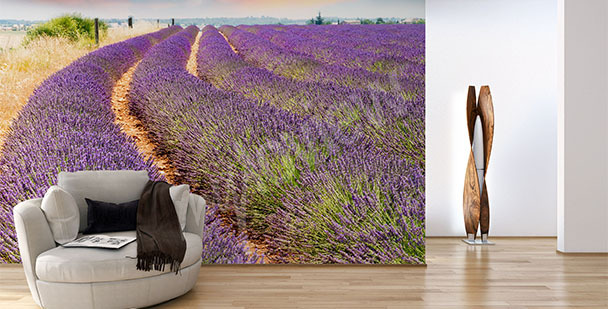 A décor in Provencal style cannot be completed without a large format wall mural with a lavender field. 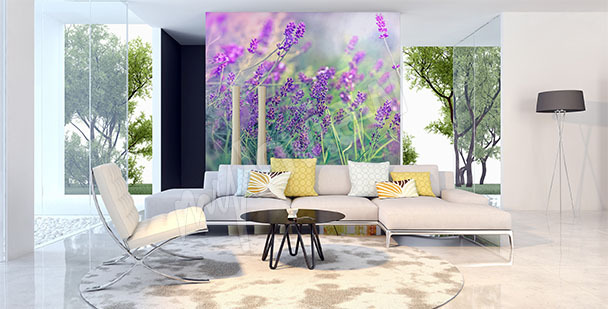 A delicate print on a lavender wall mural will refresh your living room interior, filling it with subtle colors. Lavender shade of purple works well with an eclectic décor of a front hall. Apply it on the main wall. A minimalist kitchen decorated with a lavender wall mural will become more cozy. A wall mural with an image of an opened window allows us to manipulate the look of our interior, which will seem much more spacious. A wall mural with an image of sunset over Provence can be placed in a classic bedroom or a guest room. Lavender wallpaper is one of the most popular flower patterns. Why? On one hand it’s quite a neutral plant. We don’t associate it with as many things as we do with roses. On the other hand it’s very picturesque and creative. Lavender fields remind us of relax, idyllic atmosphere and rural views. We can easily fit it into almost every kind of interior. It all depends on the color palette of the image, the level of color intensity and the size of the flower design. With help of a lavender wallpaper, we have a chance to completely change our living room or bedroom: the style and reception of a space decorated with flower motifs is characterized by delicacy, airiness and lightness. A picture of a zoomed-in lavender can be an interesting combination of nature and art. It’s not about realistic depiction of the plant’s look, but about the visual effect: brightening, energy and freshness. A lavender field wallpaper can be based on a slightly blurry picture with delicate light reflections and intertwining colors, which will create a very pleasant aesthetic effect.Such decoration will look great when strongly emphasized: in a kitchen or dining room, among white sterile furniture; in bright, full of daytime light interiors and bedrooms. Accessories are also important: pastel elements will complement delicate design of an interior. Another interesting and inspiring idea is lavender on wood, most often painted white. It’s mainly used in bedrooms: it will look good on a wall right by the bed. This way, a lavender field wallpaper will become a unique visual frame of the “night zone” and will create a place full of charm, where we can easily relax. A lavender mural on wooden planks will look just as good in a kitchen. Together with wooden furniture and country-style accessories, it will create a harmonious whole. 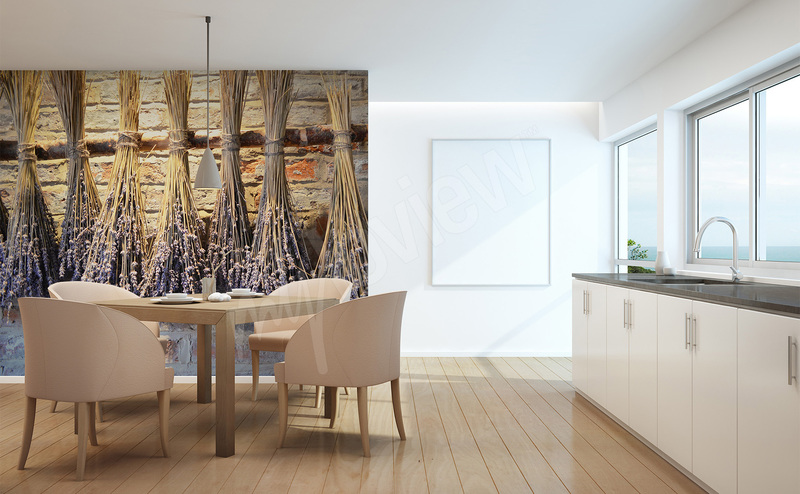 You can choose an image depicting dried lavender, that will look exceptionally good while surrounded by real dried herbs or potted plants. 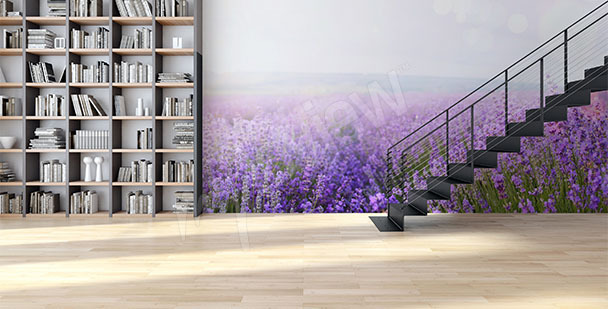 In this case, a lavender wall mural on brown wooden planks will be a great choice. This is the most impactive decorative solution, that will help you to optically trick an eye of an observer. 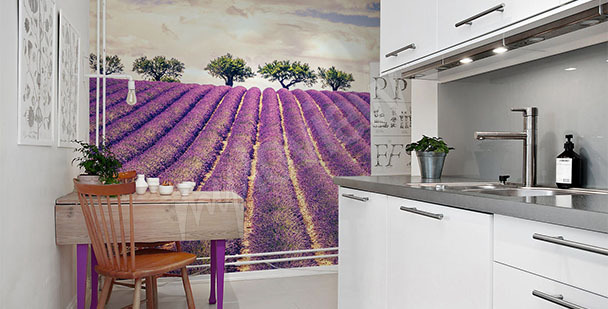 A lavender field wallpaper will allow you to achieve an effect of space enlargement by combining depth and perspective. It’s the most complete solution, that reduces a need of investing in additional decorations to minimum. 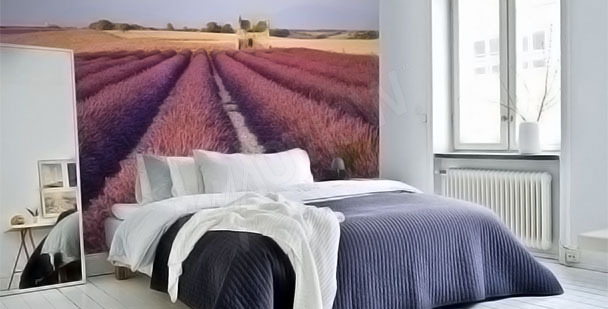 Lavender mural will set a central point of your room and will attract all of the attention. We can choose a whole lavender field. One is certain: lavender wallpaper should complement the color of furniture or other decorative elements. It’s best to create a color palette and follow it all the way through the decoration process. A lavender wall mural will fit a children’s room, especially the one occupied by a little girl: delicate colors, elaborate patterns and beautiful, far-away perspective will surely be appreciated. 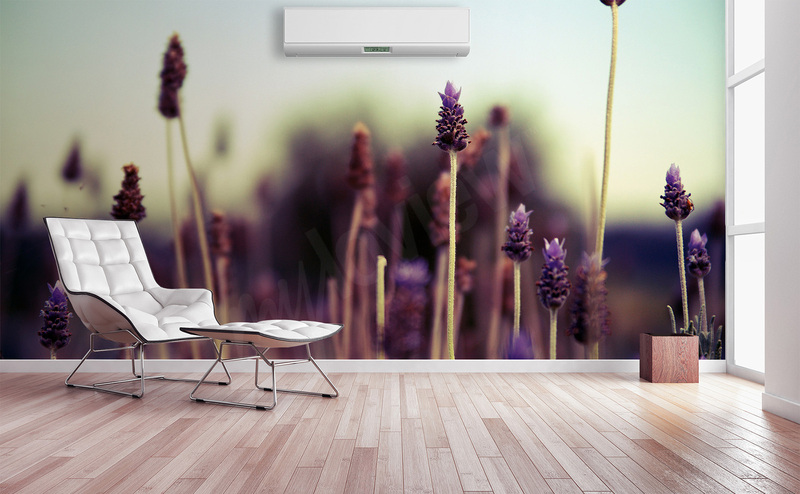 If you have a big, white wall, an interesting option would be a lavender wall mural in form of a tryptic. An image on a lavender field wallpaper divided into 3 parts will add a bit of a modernity to this traditional, rustic decor.